I had intended to write a blog post days ago. But with summer ending, school starting, a husband having knee surgery – I haven’t even touched the computer for a few days. We went away last week for a family trip and last hurrah of summer vacation. As always, it was good to get away and hang out together. We’re at a pretty awesome stage with our kids right now where they all like going on road trips all together. We’re milking it. We liked Yellowstone so much last year, we decided to head that direction again. 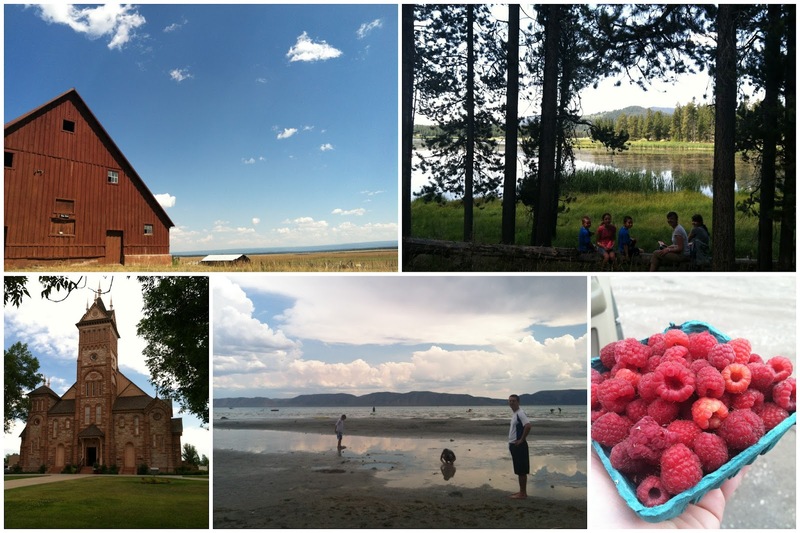 We stayed a few days in south-eastern Idaho first. It was absolutely beautiful – in a big-sky-western kind of way. There was also a nice balance of kitsch to go with the scenery. I mean, who doesn’t want their own giant Teddy-Bear sofa? And inside Yellowstone, the scenery is incredible. Driving through the beautiful surroundings felt so therapeutic for me. I worked on some more orange peel blocks on our drive. I started this project on our summer family vacation 2 years ago! Perhaps one day I will have enough and actually put them together in a quilt. This summer has been a busy one, and a somewhat more tiring one than usual. I have one of those thyroid glands that does not work as well as it should. For the past 15+ years I have taken synthetic thyroid medication to compensate, and for the most part it has done a good job. I tried a different medication this spring and it threw my body out of whack. I had to go off everything all together for a few weeks so we could retest my levels, and then have been gradually building those levels back up to ‘normal’. As a result I was frequently physically exhausted for most of the summer. I’m happy to report that I’m feeling tons better now. Yay for that. On top of that, I was asked to take on a busy responsibility in my congregation at church. (Our faith has no paid ministry – all congregations are staffed by volunteers only, with leadership and service responsibilities rotating among the members.) This time it’s my turn. I enjoy it because I get to work with all the women in our congregation, particularly those who might be going through a hard time. It’s not something I asked for, and it’s demanding on my time, but I enjoy it because I love these sweet women. Can you see the hexagons I was working on in the car, reflected in the window? So summer has felt physically and emotionally taxing this year – even more so that usual. There are many emails that I didn’t respond to (my humblest apologies if you’re one of them), I never did my summer closet clean-outs, I did far less sewing, my sewing room is a disaster, we had fewer trips to the pool, etc. ; but I keep reminding myself that I did do things that mattered in the bigger scheme of things: visiting hospitals, taking care of extra children, doing things with my kids. What mattered most got done. And it was great. I’m glad for that perspective. And now school is back in session. I have a lot of catching-up to do, and classes to prepare for this fall. I haven’t touched my machine for weeks, but I just picked up these two quilts from the quilter. I think some binding sounds equally therapeutic right now. And then: something fun and finished to share. You have to take time for yourself, and thyroid adjustments are no small deal. My brother-in-law and his wife live really close to Yellowstone, and yet we haven&#39;t been there since our honeymoon, many years ago. I would LOVE to visit there again. Your hexies are just beautiful. I hope your husband&#39;s knee and your thyroid get better!<br /><br />That teddy bear sofa looks really comfortable, but I probably wouldn&#39;t own one. XD<br /><br />Can you post more about those two quilts? They look pretty! You visited some amazing places, and I totally want that teddy bear sofa!! !<br /><br />Hope they have your meds sorted out now, you have so much to keep up with! It sounds like even though you didn&#39;t do some of the &#39;thought&#39; you though you should. You are where you are suppose to be. It is just one of the seasons of your life. Enjoy every moment with the kiddo&#39;s they grow up way to soon. You have a lot going on at the moment….your faith will see you through. I enjoy reading your blog…love the &quot;orange peel&quot; blocks! My goodness. What a summer you have had! I have to keep telling myself that in 10 years I won&#39;t look back on the summer of 2013 and think &quot;gee, I wish I had holed myself up in my sewing room more often.&quot; Perspective is a wonderful gift, isn&#39;t it? your trip looks like it was amazing! I&#39;m glad you&#39;re feeling better and that your meds are worked out again. That kind of thing make much more of a difference than we give it credit for! I&#39;d be milking it too, you all looked like you had a fantastic time. Kids are awesome at that age. But guess what? They get even better as they get older, can you believe it? Well, mine did anyway. Teenage troubles sure … but they are more my friends than ever. Have lots of fun! Your little hexie project is delightful – seeing it inspires me to try hexies. Thanks for sharing! Such a good post Amy! I know I can always use reminders about what matters most! Love your projects…and hope you are feeling better ASAP! You have your priorities straight and I really admire you for that. You have had a very full summer and still managed to keep in touch with your readers and all. No apologies needed ! You are amazing ! You are not in the thyroid boat alone, me too! Glad to hear they are working the meds better. Love the Teddy bear couch. I&#39;m dying to know where it is! I&#39;ve been toying with Yellowstone for next year&#39;s vacation. It looks beautiful. Your title says it all – taking care of yourself and your family are the most important things. I&#39;m so glad to hear you are feeling better. It sounds like you&#39;ve had the perfect summer. Sorry to hear about your thyroid woes — but glad to hear you&#39;re feeling better. I LOVE that orange peel — it&#39;s on my Too Big for this Lifetime List! Kids grow so fast, you did exactly what you should have been doing. Best wishes to your DH as he recovers from surgery. And I&#39;m sending good thoughts for you too as you recover from your thyroid med upheaval. Glad you&#39;re feeling better :). Love your orange peel blocks and hexies! They are going to look so good in a quilt. I just live this post. <br />I hope things settle down and you feel strong and &quot;healthy&quot; really fast. How timely this post was! My mom had to be take to the hospital for severe dehydration and they found she had hypothyroidism and her TSH was 28! We&#39;re wondering now how long it&#39;s been out of balance and if that led to many of the other symptoms she&#39;s been having. I&#39;m glad you&#39;re feeling better and can&#39;t wait to see those two quilts! Your blog is one of my favorites. the photo of you and the kids by the waterfall on that overlook – been there! 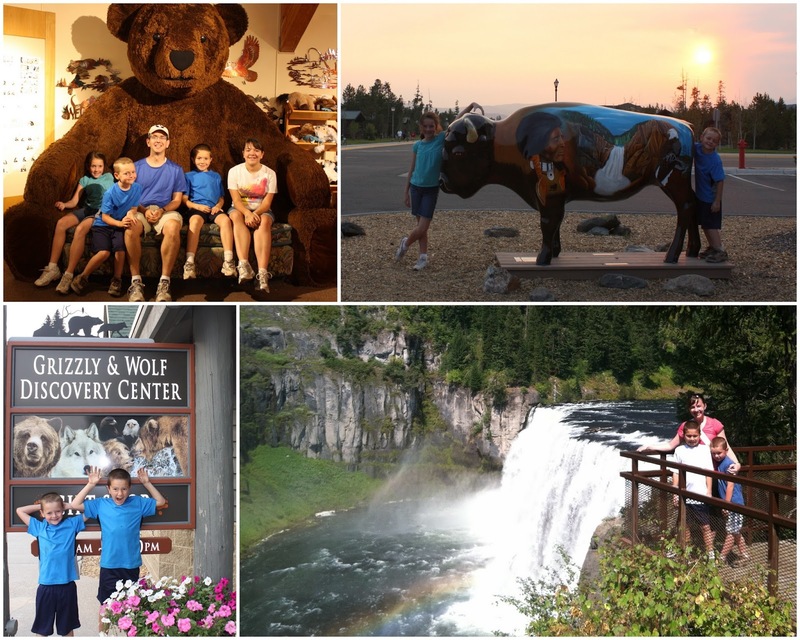 recognized it right away – we love Idaho and Wy and have been to the area tons of times – used to live in Idaho for awhile and saw a lot of the eastern side of the state and some of the central as well. I so want to start an orange peel quilt, did you use a specific template or just design your own. Have looked around, but haven&#39;t found a shape as good as yours!